Thursday April 26th 1894 I was too tired to do any thing out of doors in the forenoon. I raked some in the yard west of the house in the afternoon. The boys finished plowing on the west side of the road today. Friday April 27th 1894 Will was using the dish harrow on the east side of the road and Leonard raked the leaves along the north yard fence. I put in all forenoon watching the turkey hens and them they got away from me. Leonard was trimming the trees west of the house in the afternoon. I worked out in the yard till supper time. Saturday April 28th 1894 I was busy with baking and churning all forenoon. We went to town in the afternoon. Will began the plowing on the east side of the road. I was over home awhile. They are very busy over there Fanny has not felt well this week. Will bought a horse for Leonard he brought home. It has been a hot day and threatening rain. 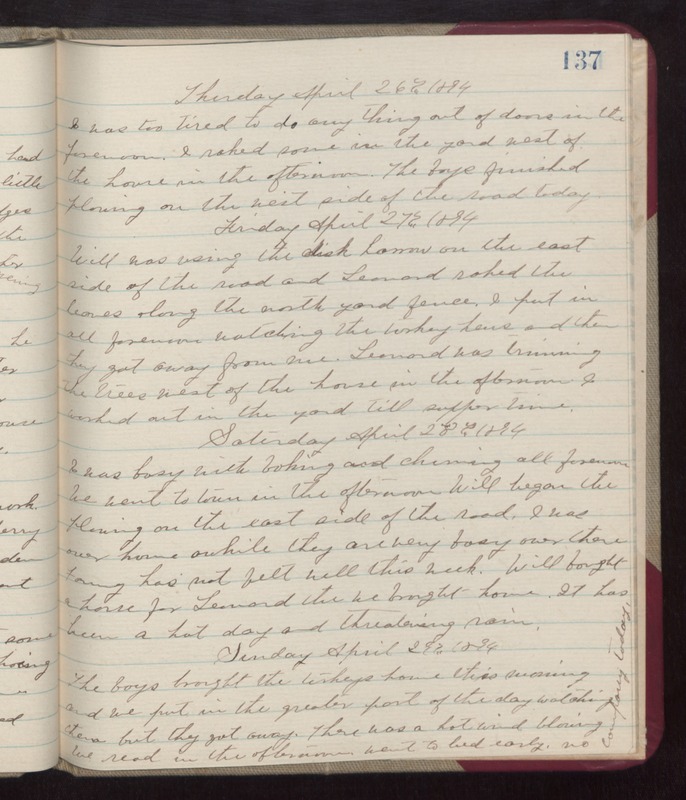 Sunday April 29th 1894 The boys brought the turkeys home this morning and we put in the greater part of the day watching them but they got away. Thee was a hot wind blowing. We read in the afternoon. went to bed early. no company today.